Have y'all heard of this stuff? I had never played with it before and it was certainly new to Ellie. A sweet lady from church gifted to her, knowing that we are getting lots of presents for the new baby and that she might need a special present of her own. Some people are so thoughtful! As I was putting together my post for last week's preschool activities, I realized that I haven't shared Ellie's journal with y'all. It is nothing fancy - just a composition notebook that I decorated with her name. I glued some cardstock to the front and then applied Mod Podge to the entire cover (a couple coats, drying in between). Most all educators and early childhood specialists agree that the most important teaching tool for children is reading. We can do pre-writing practice and learn about numbers but it is critical that we read, read, read! Ellie loves to be read to and to keep it exciting, I look for books at the library that I think she will enjoy and circulate them into our reading schedule with some of our "regulars" like Where, Oh Where is Huggle Buggle Bear? and Corre Perro, Corre! 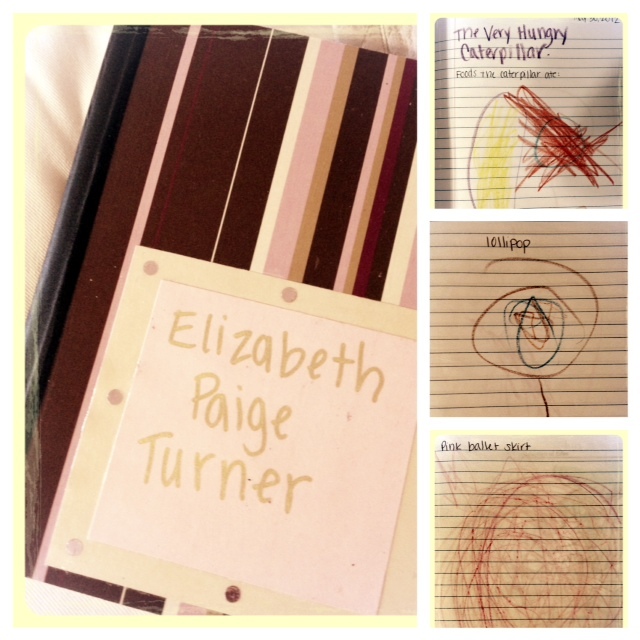 Journaling is a great way to expand on reading and introduce toddlers to writing. One of the first books we read after I introduced Ellie's journal was Eric Carle's The Very Hungry Caterpillar. After reading the story, I had Ellie draw something she remembered from the story. I try to date each entry and put the book or theme that corresponds with her picture. Since beginning the journal, Ellie has learned how to write most of her letters. We will start incorporating some letter practice in here too but, obviously, a journal can be adapted to any age. In my last post, I shared one day of our letter F week about Fish. I'm finally getting around to sharing the other activities from last week. All of the themes I used (except fish) came from Preschool Alphabet. We read Piggies by Audrey and Don Wood. Preschool Alphabet suggested painting a handprint but apartment life has been a little too chaotic for that (I'll spare you the details). Instead, I traced Ellie's hands and let her add pink fingerprints to the tip of each finger to look like the piggies from the story. Then, she used a pink crayon to draw faces and ears on all the pigs. Instead of making a touch and feel book, we just made a single picture with a few items I was able to scramble to find around the house. Not very impressive, I know! But it was fun to see how Ellie described the different items and record her response. It also made me aware that she isn't familiar with a lot of adjectives to describe how objects feel and that is something I will focus more on in this fall. 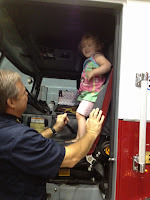 We were fortunate to go to our local Public Safety Expo several weeks ago. We spent the entire week talking about safety (primarily related to cars and traffic). 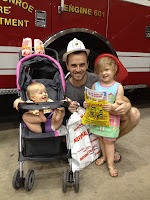 At the expo, we got all kinds of great freebies that I filed away for different lessons and review on safety. I pulled out the fire safety diagrams and coloring books for Ellie to work on this day. 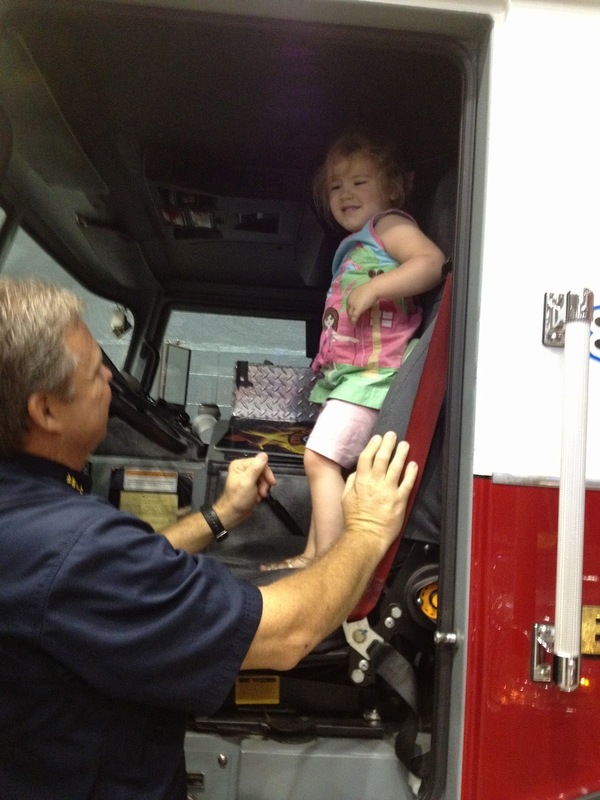 After discussing fire safety, I made sure to ask Ellie important questions to ensure she understands what to do in a fire emergency. We practiced "Stop, drop, (cover your face) and roll!" several times. Of course when I was reviewing with her and asked, "What should you do if your clothes are on fire?" She responded, "I say, 'Excuse me ma'am, my dress is on fire!" Sigh. At least she remembers her manners. We talked about the different sounds animals make and tried to guess the animals on this farm animals quiz. Hannah Rose thought this part was so funny! Then we read farm related books. After the story, I asked Ellie questions to help her make connections to our farm theme i.e. self, family, community and the world. We talked about how we recently visited a farm for a friend's birthday party. Ellie actually got to milk a cow! I explained how that milk can then be sold at our grocery store and the same with the chicken's eggs. We colored some pictures of farm animals. I had also wanted to make a grass collage but we didn't have time. To review shapes, I got out some yarn and explained how the yarn we buy at the store comes from sheep's wool all around the world (another connection). I had her feel it and then cut off about a yard long piece and tied the ends together. We laid it out on the floor and made different shapes with it. It was fun to show her how a circle can be stretched into an oval and, similarly, a square to a rectangle. I had also planned to use "Fall" as a theme this week but it was rainy and the leaves haven't changed colors. I think we'll save that for a little later this year so that we can incorporate more science application as we compare the leaves and their colors. Does anyone else remember the book The Rainbow Fish by Marcus Pfister? I have always loved that story! I know I have been posting a lot of letter of the week summaries and I am just about caught up. This past week we worked on the letter F and I was so excited to implement "F is for fish" as one of our themes for the sole purpose of reading this book! I love The Rainbow Fish and was rather sentimental to have the opportunity to share it with Ellie. 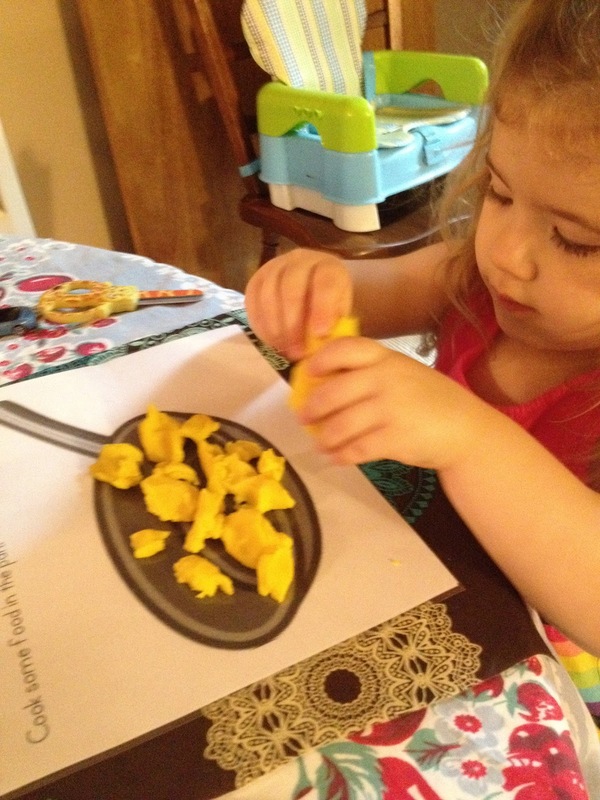 To begin, we worked on the fish counting printable from Confessions of a Homeschooler. Next, I asked her some of the pre-reading discussion questions found in this devotional. After reading the story, we discussed the devotional post-reading questions and read the Bible account from Mark 9:33-35 about Jesus' disciples arguing about who was the greatest. There are two devotionals in that link and we used the second for our Family Bible Time later that evening. It was fun to read the book again and discuss another valuable lesson about true happiness and sharing. For her craft project, I had Ellie paint a picture using the colors of Rainbow fish (blue, green and purple). After her picture dried, I cut out a fish pattern and had her glue on the last remaining shimmering scale that Rainbow Fish had (aluminum foil). I think we might hang him in her room. I got this idea from A to Z Teacher Stuff - they have several great ideas for this book. After nap, I took the girls on a surprise trip to Walmart and we bought two goldfish to bring home! Ellie is loving the goldfish...possibly a little too much. I'm still having to explain to her that she cannot touch them and play with their water. She loves feeding them and watching them swim around. She named one Rainbow Fish and the other Nemo. I also was going to buy her a small bag of Goldfish crackers as a special snack but she wanted mini M&M's instead. How is a pregnant lady who is craving chocolate supposed to argue with that? M&M's it is. The highlight of our letter E week was our "E is for Ellie" day. We worked on spelling Ellie's name on a white erase board. For the craft, I taped off a capital E and let Ellie paint a picture. When it dried, I removed the tape to display her E painting. 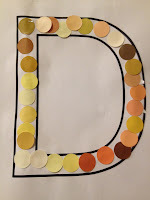 Our watercolors were a little weak but you can see a better example over at Blissfully Domestic. For our story, I read one of Ellie's favorite books Where, Oh Where is Huggle Buggle Bear? by Katherine Sully. I picked this one not only because it is one of her favorites (and mine too!) but also because one of the characters in the story is an elephant named Ellie Nellie. I had her identify the name Ellie on the pages it was written. For our Spanish activity, we practiced introductions using "Me llamo _____." 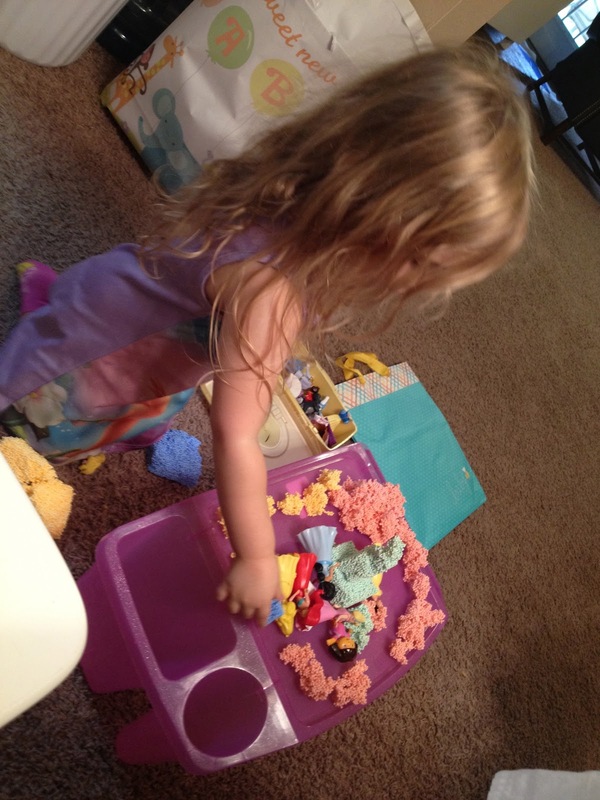 To allow for lots of repetitions, I got out her toy princesses for us to play with in Spanish. 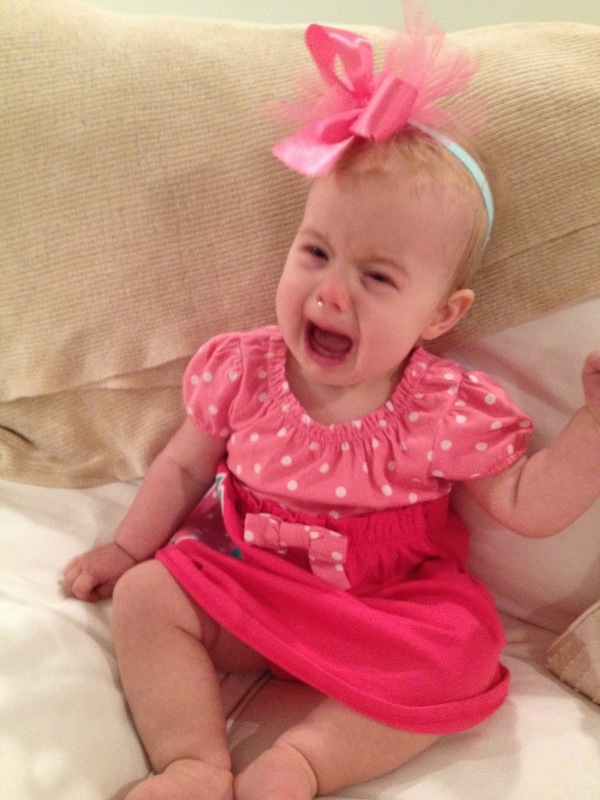 I role played a few dialogues with the prince and princesses and soon Ellie was ready to join in! Prince: Hola. Me llamo Prince Charming. Como te llamas?Princess: Me llamo ____. (Ariel, Snow White, Cinderella...you get the idea! )Prince: Mucho gusto. Ellie was hesitant to respond in Spanish and I didn't force her to. It is very normal for early language learners to respond in their first language even when being questioned in a different language. It is a natural part of language acquisition and I have to remind myself of that. It sure is funny that I know what all the research on language development says from past research I have done, but yet I still find myself expecting my own child to instantly be fluent. Language learning can be a slow process and the only way to "speed it up" is to incorporate more of the target language. Ellie could be immersed more in Spanish if we only used Spanish in our daily conversations, music, stories, etc. Is anyone else out there trying to teach their toddler a second language? How is it going? How do you consistently use the second language with him or her? As this pregnancy comes to an end, our school time is getting a little less extensive. Translation: This should be a short post. 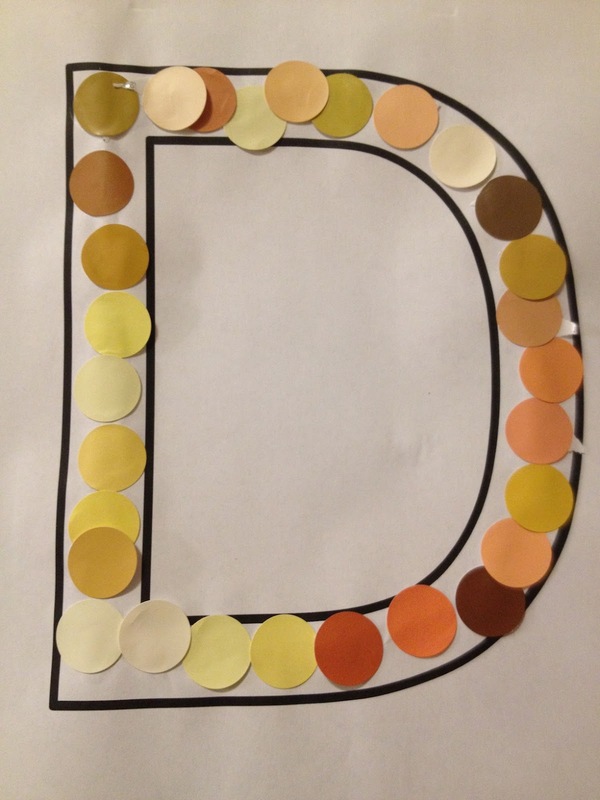 I went through Preschool Alphabet's archives for the letter D to decide which themes and activities to use, like "D is for Dog." I also used the prewriting practice and other dinosaur printables from Confessions of a Homeschooler. I love this Five Little Ducks printable from PickleBums. We also listened to this bilingual song. 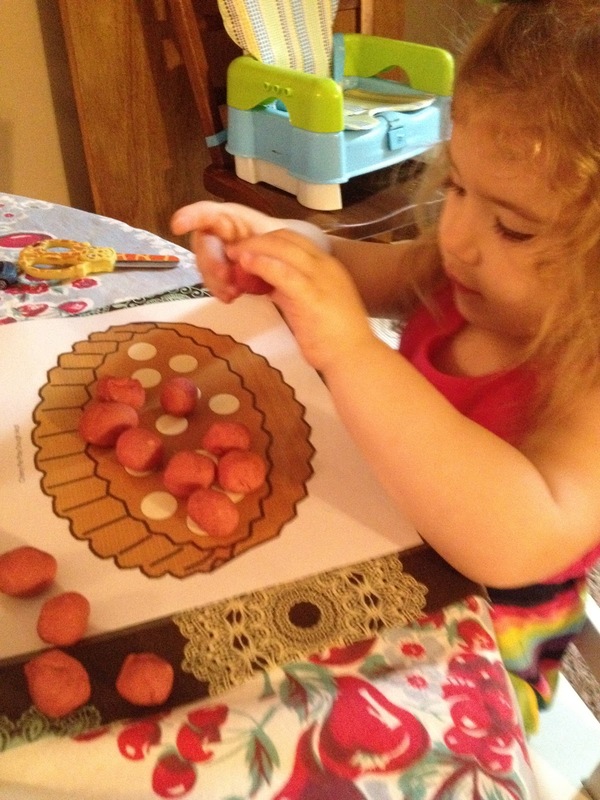 Playdough is not only a fun activity for toddlers but it also beneficial in developing their motor skills. I made several colors of play dough for Ellie using this recipe from Art Nest. I may just be out of the loop but I only recently discovered playdough mats. I found an entire packet that you can download over at Planet of the Apels. Eventually I need to have them laminated but for now I just stuck them in plastic page protectors. 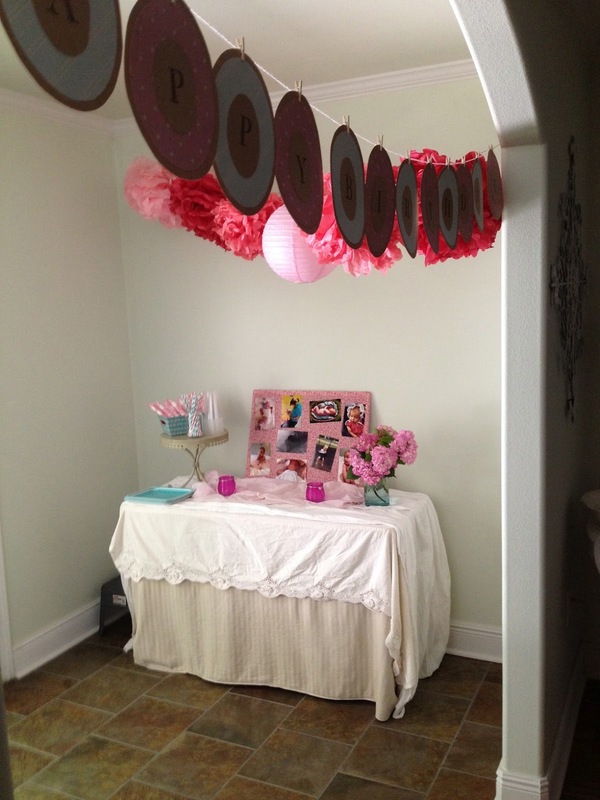 I'm finally getting around to sharing pictures from Hannah Rose's first birthday! I used a lot of leftover decorations from Ellie's Fairy Party. I did not have a clue what kind of theme I wanted to use for her party but when I found matching strawberry dresses for the girls at Target (for less than $4 each), I planned the party around them :) The dresses aren't a traditional red/green strawberry but are more pink and aqua - which worked out well since those were the two main colors I used for Ellie's party. I invited only a few guests that we consider our "family away from family." This was a Saturday morning affair so we made it a brunch - but more on the food shortly. First, here are the pictures! The girls in their matching dresses. No one wanted to cooperate for a picture. Can you tell? The birthday girl did not appreciate all the picture taking. The weather cooperated so we were able to eat outside. 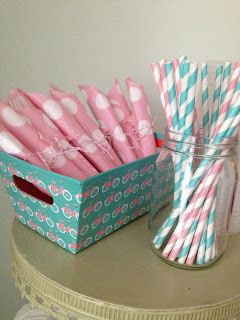 Straws and napkins were leftover from Ellie's party. You can order the straws here. The napkins and caddy are from Target. To display pictures, I covered an old cork board with fabric. Then I took plain, plastic push pins (thumbtacks?) and spray painted them. If you stick them in a piece of styrofoam or cardboard, it is very easy to paint them quickly! 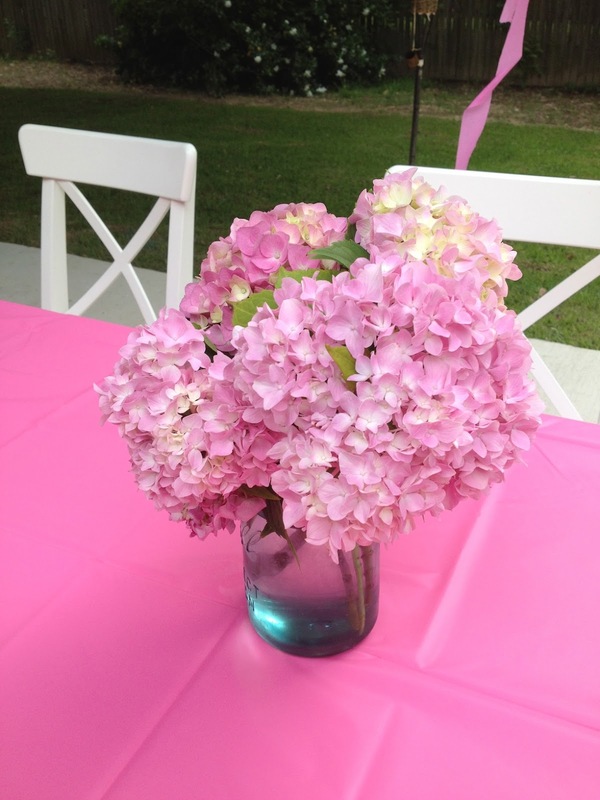 A good friend supplied the flowers from her garden. Love! 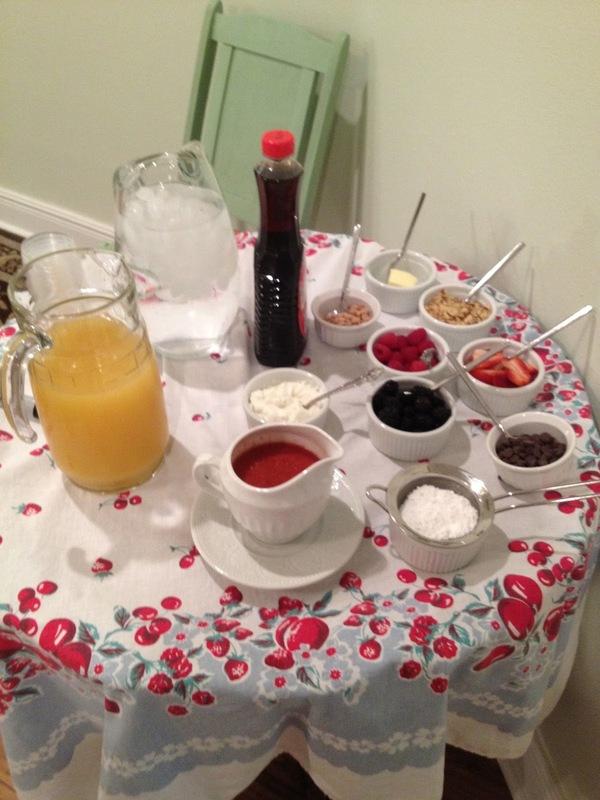 For brunch, I served two types of breakfast casseroles and Belgian waffles. To fit in with our strawberry theme, I included a homemade strawberry syrup as one of the many choices on our toppings bar. 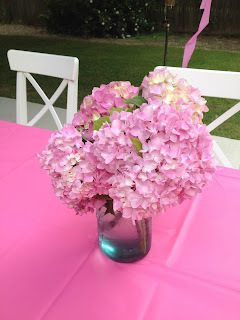 For party favors, each family received a strawberry basket with a miniature strawberry plant and pink soap wrapped up in pink tissue paper and tied with my favorite cotton candy pink baker's twine. No picture can be found, sorry! 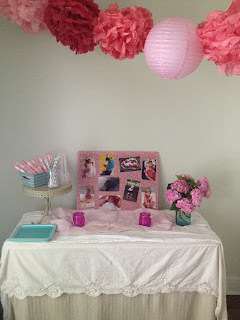 What kind of party are you hosting for your kids? I need some ideas for the coming year!